Even in the presence of faith, cancer is a scary word. It shouted its way into the vocabulary of my family seven years ago when I was diagnosed with melanoma. Once again, it has forced its way into our personal language, by entering the life of another family member. It is a word that doesn’t discriminate or show mercy. It’s an ugly by-product of our fallen world. There are many other scary words out there; spawned when perfection was shattered in the Garden of Eden. Divorce, abuse, suicide, disease, infirmity, financial hardship, to name just a few. They are real words that cause real pain. They can easily become weapons that satan uses to steal our joy, obscure our blessings, cause worry and anxiety about tomorrow, blurring our vision to the point where our human-sized problems overshadow a universe-sized God. Jesus Christ said that in this world we will have trouble. (John 16:33) Not if, but will. Not if, but when. He isn’t the world’s biggest pessimist. He is the world’s only Savior. He knew that only the sacrifice of His life would be the answer for a world jolted by sin. He knew that only in Him is there a promise for an eternity without tears and sadness. Only in Him is there the gift of His Spirit living inside those who become children of God. Only in Him is there the strength to hold on, hold up and hold fast. Our words can’t out-shout, out-cry, or out-last the fallen-world words, but the One who is known as The Word* can. His words say: ” But take heart, I have overcome the world.” That’s not an empty promise or a “feel good” expression uttered at a superficial level. It has soul-deep repercussions. It doesn’t make the promise to calm every storm, but it gives the promise of an anchor to hold on to. It doesn’t present the hope for an easy life, but it guarantees an eternal life that is beyond the imagining of the here-and-now life we cling to so desperately. It reassures us that the hand which created the world is the hand that sees us through this world and into the next, holding on, never letting go. 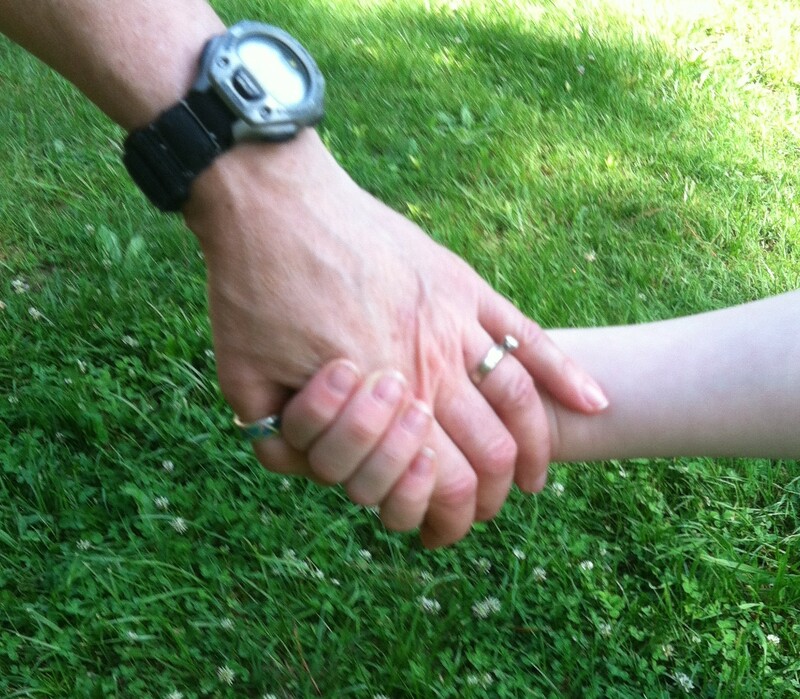 My youngest child loves to hold hands when we walk. Her little hand slips into mine or her daddy’s in such a comfortable, natural way. A trip to the chicken pen in the backyard or to the end of the drive to get the mail, with her hand in mine, turns the ordinary into the extraordinary. Psalm 33:6 says: “By the word of the Lord were the heavens made, their starry hosts by the breath of His mouth.” The same God who spoke the stars into existence has a hand ready for you to slip yours into. The hand that crafted your body and gave you life is the same hand that can turn weapons into tools. Instead of destroying, God can make the fallen-world words instruments that shape our character, refine our faith, draw us closer to Him and teach others about the hope we have in Him. In Him, in His hands, there is hope, comfort, peace. The ordinary can become the extraordinary. The frightening can become reassurance in the One Who is Trustworthy. Each breath, each day, is a gift. The real gift, however, is life in Him. If you need to know what that really means, or how to be in Him, ask me at janey.d@hughes.net. If the subject of this post touches your life and you want to share, please make a comment, so that others may be inspired by your words. If you know someone who is dealing with their own fallen-world words; please share this blog along with your prayers for them. His hand is stretched out. Will you take it? Tica, thanks for the sweet comment; but really, all I ever did was to remind you where to look.